AutoLog is a full-featured data acquisition system used to acquire and store all of the Batch Total information available with the Autoquip Gear Pump system. AutoLog software directly prepares your 2K data into a spreadsheet format, enabling users to easily formulate custom reports using full featured word processing, spreadsheet and database programs. In addition to capturing, storing and allowing for immediate retrieval of the internal workings of the Autolog 2K, totalization data, flow rate data and recipe specific data is available at a very close to real time rate. 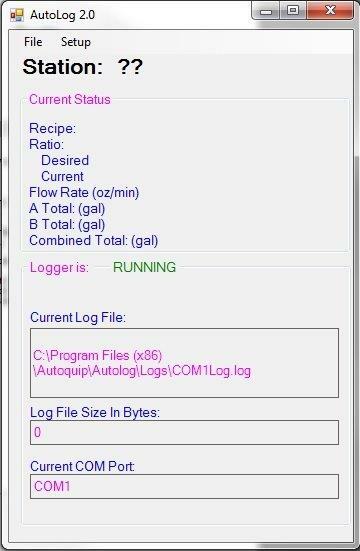 The AutoLog 2K (Autoquip Gear Pump) network also allows for the direct control of selected recipe and recipe data. Through specific available software, an external computer or programmable controller can select or alter the desired recipe or information within the recipe. This is an important improvement when multiple Gear Pumps are installed on automatic equipment. Autoquip’s Autolog delivers an automated method of collecting and reporting V.O.C. and solvent emissions. It features single and dual component paint usage recording and V.O.C. generating software with optional solvent usage. A Windows-based communications and spreadsheet database records flow usage and uses the flow usage information to calculate and report sub components, such as volatile organic compound (V.O.C.’s). AutoReport software uses the data acquired by the AutoLog software package and information entered into a spreadsheet program to generate full featured environmental reports. AutoReport is designed to sub-divide by chemical composition each unit of paint and hardener into V.O.C. and non V.O.C. usage totals. AutoReport can be programmed to provide sub and grand totals for all V.O.C. producing liquids passing through the Gear Pump along with non V.O.C.’s totals and subtotals by color and material type. AutoReport software allows for pictures and graphs to be inserted – VOC totals, Recipe Data, Flow Totals, Solvent Totals.